With Contrast your applications automatically detect and fix vulnerabilities, identify attacks, and defend themselves. Contrast Security is the world’s leading provider of security technology that enables software applications to protect themselves against cyberattacks, heralding the new era of self-protecting software. Contrast’s patented deep security instrumentation is the breakthrough technology that enables highly accurate assessment and always-on protection of an entire application portfolio, without disruptive scanning or expensive security experts. 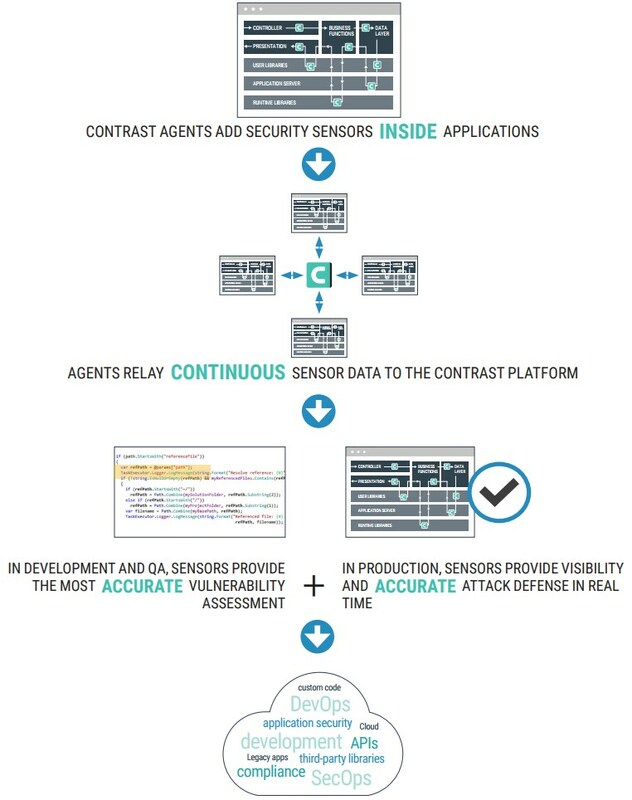 Only Contrast has sensors that work actively inside applications to uncover vulnerabilities, prevent data breaches, and secure the entire enterprise from development, to operations, to production. Contrast Assess – Contrast Assess is a revolutionary application security testing solution that infuses software with vulnerability assessment capabilities so that security flaws are automatically identified. Contrast Protect – Protect by Contrast provides Monitoring and Protection for Cloud Applications. Leveraging patented deep security instrumentation makes Contrast the most accurate, fastest and scalable application security solution. Protect works well with legacy, containerized or cloud-based applications, ensuring Accuracy, Coverage, Scalability and Performance. Get started with Contrast Enterprise in minutes. Simply add the Contrast agent to any application server and it starts working within minutes. The agent reports to the Contrast TeamServer, available either as a cloud service or deployed on-premise. Real-time Vulnerability Detection & Expert Guidance – Contrast Enterprise monitors Java and .NET code execution, data flow, configurations and more, to quickly find dangerous vulnerabilities with virtually no false positives. Code level pinpointing eliminates guesswork, while context sensitive guidance enables quick remediation. Attack Visibility – Contrast Enterprise patented deep security instrumentation enables application reporting where none existed before. Contrast Enterprise identifies and logs all attack events for integration with third party log management and SIEM solutions. Additionally, users can define custom logging parameters for deeper insight and analytics. Software Supply Chain Analysis – As much as 80% of application code comes from open source and thirdparty libraries. Contrast Enterprise automatically discovers third-party libraries, alerts to the known (and unknown) risks they may bring with them, and provides critical versioning and usage information that helps remediate risks. Portfolio-class Scalability – Contrast Enterprise transparently automates application security to support application portfolios of virtually any size. New applications are discovered automatically as they are run. Executive level portfolio dashboards display the entire portfolio security posture in realtime. Non-intrusive Agent – Contrast Enterprise uses modern agent technology that instruments without impacting production application performance. Instrumentation is done at runtime, so no code changes are required. Agents integrate transparently into the build process to not disrupt application development or deployment. Contrast Enterprise agents use patented deep security instrumentation to deploy sensors that identify vulnerabilities and block attacks with pinpoint accuracy from within applications. Contrast delivers unprecedented visibility and protection of custom code, libraries, frameworks, configuration files, and runtime data flow.